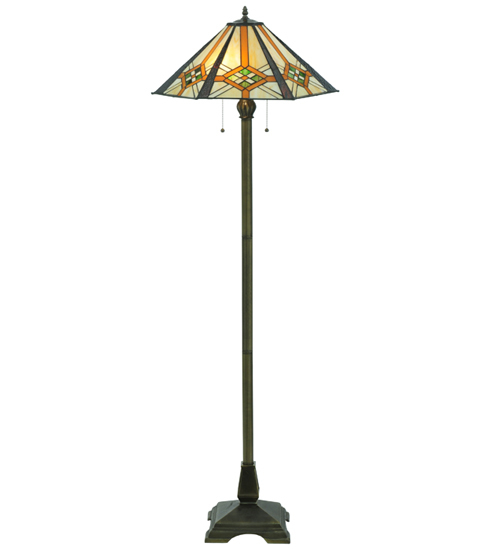 Description: This lamp shade, inspired by the clean geometric lines of the mission style, has diamonds and raised bands of Root Beer granite glass on panels of Bone Beige and Moss Green. Hand cut pieces of glass are wrapped in copperfoil and soldered together in the Tiffany tradition to make this handsome shade. The hexagonal shaped shade is supported by a 2 light mission styled, footed floor base, hand finished in Dark Bronze.